... but I have got them now. I only heard about Alma Deutscher a couple of days ago, as an accomplisged composer at not yet 12 years of age. Same for me! I've also got tears in my eyes. Thanks for sharing! Damn video must be broke because my eyes are completely dry,... but she certainly does have an awesome voice, incredible range and power at such a young age very, very impressive. 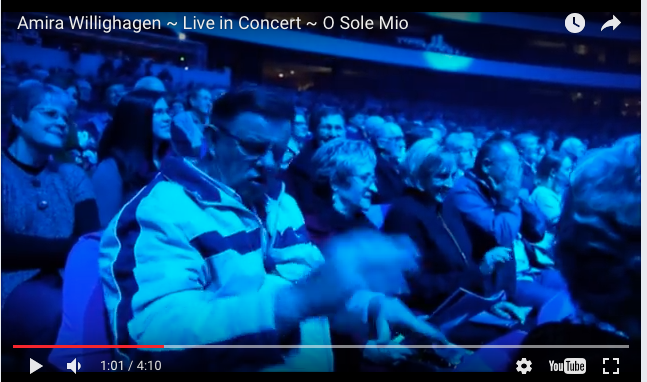 I also dug this guy sitting in the audience, when Miss Deutscher started to sing he was air-conducting all over his aisle like a madman! No to mention incredible confidence! She also still sounds like a 12 yo girl who is really enjoying herself in her interviews. Thinks of fairies and princesses to give her inpiration. Hope fame is kind to her. Hey, guys, I made a mistake in my sekection! I googled Alma and did not notice that the citations included Amira Willihagen - who it is singing on the video! Still very moving and I have heard Alma's voice elsewhere, a good voice but maybe without the range. However, her other talents make up for it! I also have tears in my eyes.